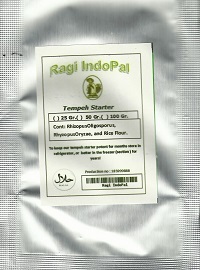 Tempeh Starter ( Contains Concentrated Rhizopus Oligosporus/Rhyzopus Oryzae and Organic rice powder) 50 Gr. Take advantage of this Extra Strength Concentrated Starter, which produces the same Tempeh output as our 100 grams standard IndoPal starter, 110 Lbs. Since half the weight, and less of starter needed, you save $4.00 on Shipping Costs! Our potent Tempeh Starters are produced via a traditional process, which gives the tempeh that special taste. Our Tempeh Starter Kit can produce more then 110 Lbs Tempeh! Our tempeh starters are designed to process beautifull white tempeh, in order to give it a nice appearance, and are pure vegetarian. 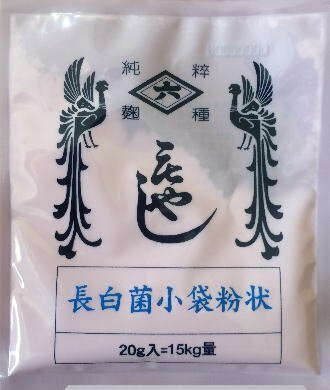 The Tempeh culture contains spores of Rhizopus Oligosporus, Rhyzopus Oryzae, and Organic rice powder, needed as a mixture medium, which makes a beautifull white tempeh, and keeps the traditional taste! Does NOT contains MSG, SOY products, and is GMO free! Our prices and shipping are the best, and produces 110 lbs Tempeh. Starter does not contains any animal products!. Tempeh is made by cooking and dehulling beans or grains and inoculating them with the Rhizopus mold which binds the soybeans into a compact white cake. The product is then incubated, causing the beans to be bound together in a solid fermentated cake. Incubation makes the cakes tasty and digestible. Tempeh has been a staple food in Indonesia for centuries. It's easy to make tempeh at home at a very low cost. Soybeans are soaked overnight, cooked for about 30 min and mixed with tempeh starter. After 28 to 32 hours incubation you have delicious fresh tempeh. Starter kit can produce more then 28 lbs tempeh. The flavor is probably unlike anything the western palate has tasted before. It is chunky, with an alarming soft pebbly texture. The flavor is meaty with a little bit of tartness -- somewhere between a ripe mushroom and tofu. When deep fried, the outer skin gets crunchy and harbors the full intensity of the seasonings you put into it. Now you can make your own Tempeh, just order our Tempeh Starter, we include clear instructions. Shipping is cheap, and soon you will be eating your own tempeh. 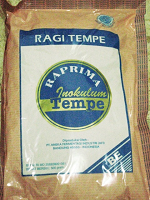 Contains: Tempeh Starter (Rhizophus Oligosporus Culture,Rhyzopus Oryzae), Rice Flour. Does not contain MSG or preservatives. GMO free. This product is manufactured, and packaged in a facility that NOT produces wheat, dairy, nut, or fish products. Storage: This starter culture should be stored in the freezer for long-term potency. Our Tempeh Starter Kits are packed in food grade foil pouches, and double sealed. 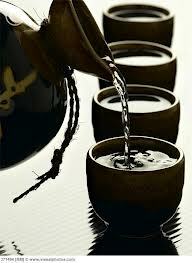 Rice Wine Starter 20 Gr.